The Hebrews of Homestead Organized on Sunday. 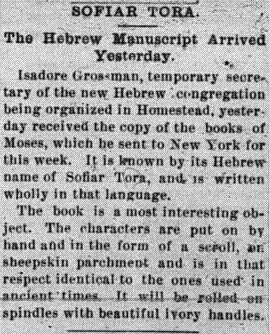 The Books of Moses Sent For–The Temporary Officers–The First of Its Kind in Our Town. At a meeting held Sunday morning 3 at 10 o’clock at the residence of S. Markowitz, on Heisel street, steps were taken toward the foundation of a Homestead Hebrew congregation. There are between 20 and 30 Hebrew residents in the Borough who will probably become members of the new congregation when it becomes a certainty. The first step in the organization of a Hebrew congregation is a novel one to those who know nothing about their customs. The first thing they have to do before holding services is to obtain a copy of the first five books of Moses. This is printed after the ancient manner on parchment, in the Hebrew language. The cost is $82. This sum was raised by subscription among the Hebrews and their friends. The parchment which will be obtained in New York, has been sent for. When this arrives, the congregation will meet regularly, and will then rent a hall on Sixth avenue and get a Rabbi when one can be supported. The Hebrew Manuscript Arrived Yesterday. Isadore Grossman, temporary secretary of the new Hebrew congregation being organized in Homestead, yesterday received the copy of the books of Moses, which he sent to New York for this week. It is known by its Hebrew name of Sofiar Tora, and is written wholly in that language. The book is a most interesting object. The characters are put on by hand and in the form of a scroll, on sheepskin parchment and is in that respect identical to the ones used in ancient times. It will be rolled on spindles with beautiful ivory handles. 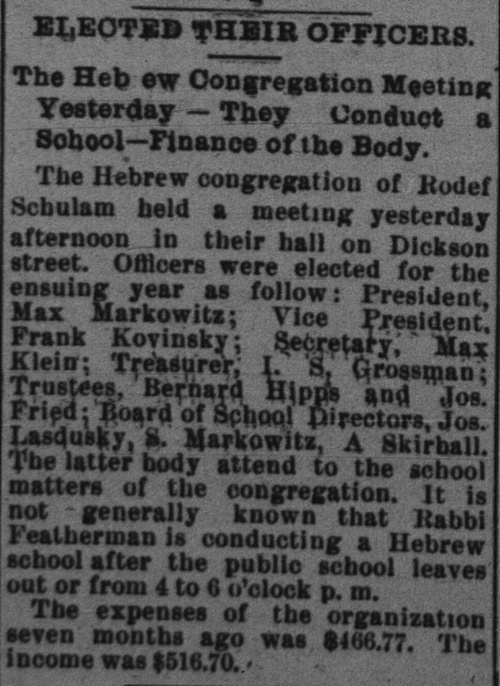 I. Grossman, the shul’s unofficial historian, considered March 18, 1894 the date the congregation was organized. A Name is Chosen and the Bible Filled out. The recently formed Hebrew congregation of Homestead, held a very important meeting yesterday at the residence of S. Markowitz on Heisel street. 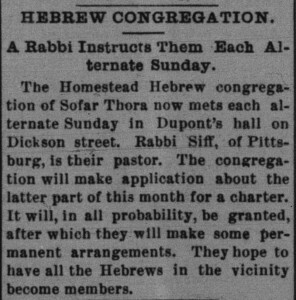 The meeting was held at 11 o’clock in the morning, and was addressed by Rabbi Davis, of the Washington Synagogue, of Pittsburg. He gave a lecture to the members of the new congregation on their duties and customs, and on all things pertaining to the organization. The Sofar Thora, their new bible, was then taken up and completed. This consisted in placing the parchment on the scroll racks, and filling out the open letters. The privilege of filling these out was sold as money is needed. The total sum realied was $63.73, which goes into the treasury. The first part of the Sofar Thora is filled out with skeleton letters. Each member of the congregation purchased the letters of his name, and filled them out, thus placing his work in a lasting manner on the bible. This occupied the day until 4 o’clock p.m. At supper time they all repaired to the dining room, where the time until 11 o’clock was spent around the banquet board. 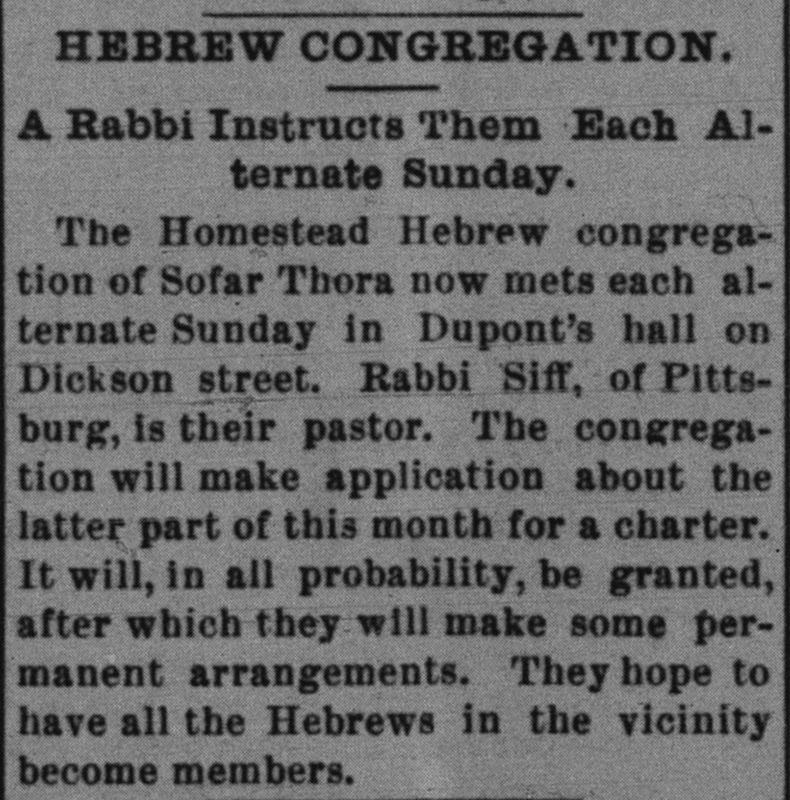 Addresses of good will, encouragement and advice were given by a number present, among them Rabbis Davis and Kline of Pittsburg, and Mr. J. Shaffer, of McKeesport, editor of the Hebrew paper, Folks’ Friend. At the meeting yesterday, a name was adopted by which the congregation will be known. The name selected was Rodef Schulom. The members of the Hebrew congregation of Rodef Schulom, desire to express through THE NEWS, their thanks to Mr. and Mrs. S. Markowitz, for the hospitable manner in which they were treated yesterday. The Hebrew Congregation to Apply for One. The new Hebrew congregation of “Rudef Schulum” held a meeting yesterday at the residence of S. Markowitz, on Heisel street, and made arrangements for securing a hall in which to meet. They have as yet secured no place, but have one in prospect. The president, Mr. Seilegman was empowered to employ and attorney and to apply for a charter, which he is to obtain as soon as possible. The charter will be filled as soon as possible after it is obtained. –An application was made to court yesterday for a charter for the Hebrew congregation. 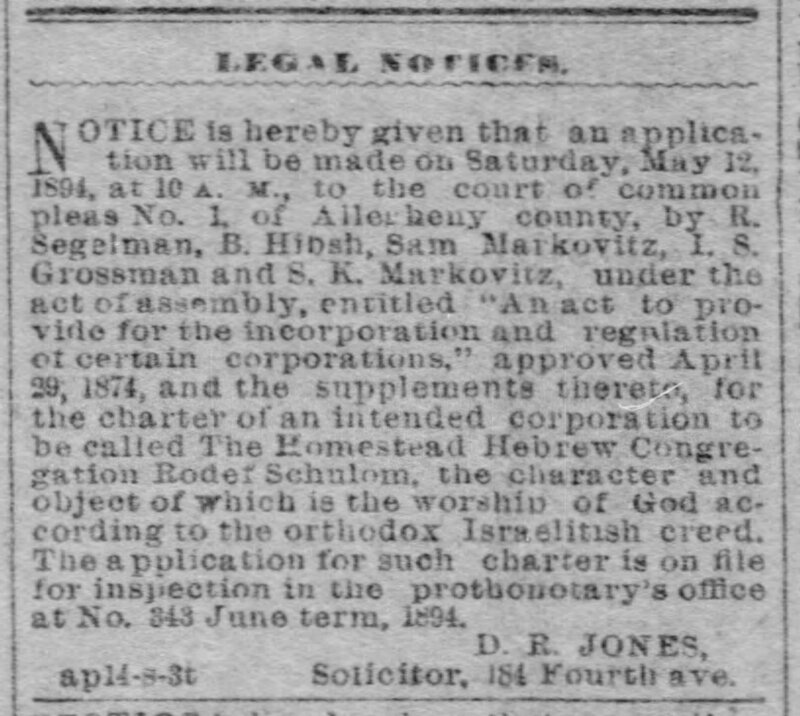 Notice is hereby given that an application will be made on Saturday, May 12, 1894, at 10 A.M., to the court of common pleas No. 1, of Allegheny county, by R. Segelman, B. Hibsh, Sam Markovitz, I.S. Grossman and S.K. 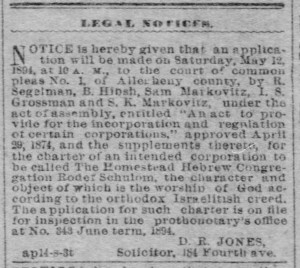 Markovitz, under the act of assembly, entitled “An act to provide for the incorporation and regulation of certain corporations,” approved April 29, 1874, and the supplements thereto, for the charter of an intended corporation to be called the Homestead Hebrew Congregation Rodef Schulom, the character and object of which is the worship of God according to the orthodox Israelitish creed. The application for such charter is on file for inspection in the prothonotary’s office at No. 343 June term, 1894. 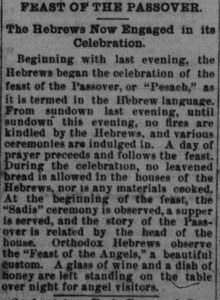 The Hebrews Now Engaged in its Celebration. A Rabbi Instructs Them Each Alternate Sunday. The Homestead Hebrew congregation of Sofar Thora now mets (sic) each alternate Sunday in Dupont’s hall on Dickson street. Rabbi Siff, of Pittsburg, is their pastor. The congregation will make application about the latter part of this month for a charter. It will, in all probably, be granted, after which they will make some permanent arrangements. They hope to have all the Hebrews in the vicinity become members. The Hebrew Congregation Hires a Preacher–Their Charter Obtained. The Hebrew congregation of “Rodef Shalom, not “Sofar Thora” as was printed recently, have engaged a Rabbi, who will reside here and assume charge of the church. A meeting was held Sunday and the credentials and recommendation of Rev. S.J. Featherman were examined. They were from many places in America and in Europe. It was decided to engage him, and arranges (sic) for a salary of $500 a year and house rent. Rev. Featherman is from Indianapolis, where his family now reside. He will remove here as soon as possible. He has been in America for five years having come from Moay Mihaly, a town in Hungary. For two years he was in New York. The next two years he was at Philadelphia, and lastly at Indianapolis, Ind. He is said to be highly educated. The congregation has received their charter. It will be here as soon as it can be recorded, probably by the last of this week. The congregation now numbers 22 persons. Meetings will be held each Saturday and on holidays. The New Rabbi Has Arrived. Rev. S.J. 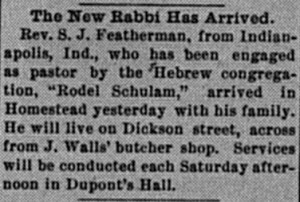 Featherman, from Indianapolis, Ind., who has been engaged as pastor by the Hebrew congregation, “Rodef Schulam,” arrived in Homestead yesterday with his family. He will live on Dickson street, across from J. Walls’ butcher shop. Services will be conducted each Saturday afternoon in Dupont’s Hall. Editor’s note: There are two J. Walls in in the 1894 Homestead city directory, but it was M. Wall who had a butcher shop at 518 Dickson on the block between the two sets of railroad tracks that ran through town. I can’t figure out what Dupont’s Hall was. No other group seems to have met there. Perhaps it is the home of a “Michael Dupont, gentleman,” which lived at 604 Dickson in 1894? 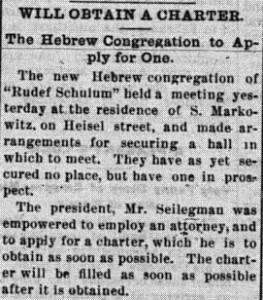 The synagogue’s first president, Ralph Segelman, died on June 22, 1894. You Keffer, the most solemn of the Hebrew’s holidays begins this evening. It is the day of the Atonement. The store of Homestead Hebrew will be closed in consequence to-morrow. All the stores of Hebrew merchants are closed to-day, and Hebrews of other vocations abstain as much as possible from labor, this being one of their most sacred holidays, the Day of Atonement. What came next in the synagogue’s history? Well, after two funerals and a wedding, they observed their first high holidays as an organized community. And then, time for new elections! 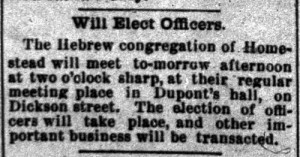 The Hebrew congregation of Homestead will meet to-morrow afternoon at two o’clock sharp, at their regular meeting place in Dupont’s hall, on Dickson street. The election of officers will take place, and other important business will be transacted. The Hebrew Congregation Meeting Yesterday — They Conduct a School — Finance of the Body. The Hebrew congregation of Rodef Schulam held a meeting yesterday afternoon in their hall on Dickson street. 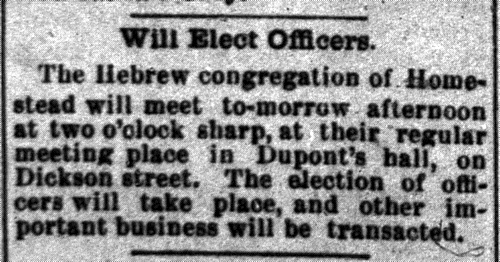 Officers were elected for the ensuing year as follow: President, Max Markowitz; Vice President, Frank Kovinsky; Secretary, Max Klein; Treasurer, I.S. Grossman; Trustees, Bernard Hipps and Jos. Fried; Board of School Directors, Jos. Lasdusky, S. Markowitz, A. Skirball. The latter body attend to the school matters of the congregation. 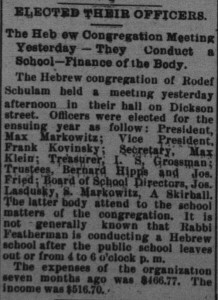 It is not generally known that Rabbi Featherman is conducting a Hebrew school after the public school leaves out or from 4 to 6 o’clock p.m. The expenses of the organization seven month ago was $466.77. The income was $516.70. 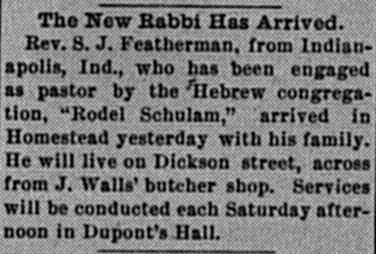 We’re very fortunate that the synagogue was organized in a year when the Homestead newspaper was covering this kind of news. 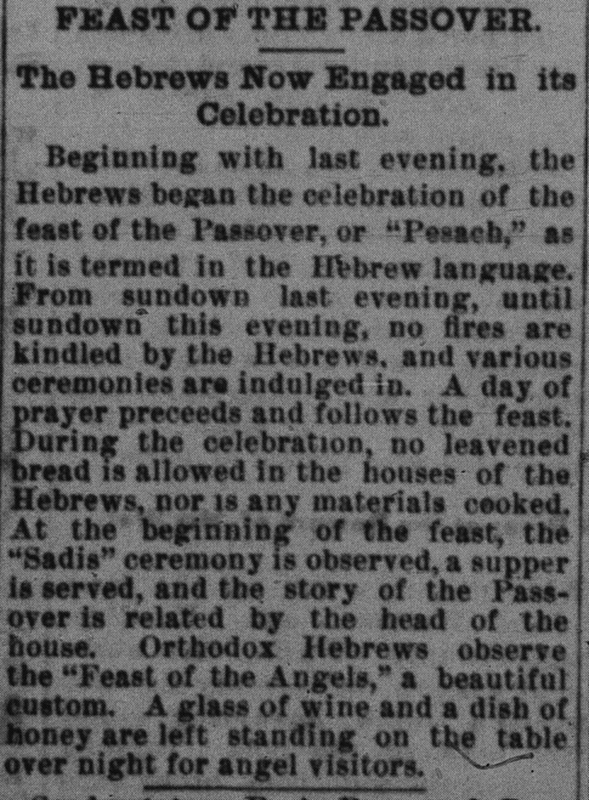 In the coming years, there would be no mention of the Hebrew congregation at all, nor much news of this sort at all from any of Homestead’s minority communities.